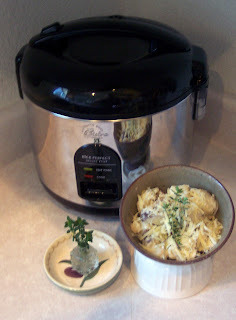 Last week I ordered a Wolfgang Puck rice cooker from the Home Shopping Network, and when it arrived I realized I had no rice in the house! But I had also ordered the Rice Cooker Creations cookbook, which offers many non-rice recipes. I adapted the Scalloped Potato recipe and came up with this one. It was delicious! Put the butter in the rice cooker and push "COOK". Let the butter melt for one minute. Add garlic and scallion and COOK for 3 minutes. Add potatoes, salt, pepper, lemon thyme, and chicken broth, and COOK for 15 minutes. Add remaining ingredients (except Parmesan) and COOK. The rice cooker will switch to WARM in about 8-10 minutes. Let the scalloped potatoes rest on WARM for 10 or 15 minutes. Top individual portions with Parmesan. Serves 5 or 6. This week, Weekend Herb Blogging is hosted by Coffee and Vanilla. Rules for Weekend Herb Blogging are here. I will delight in His deliverance. Your praise all day long. for with You is life's fountain. You know my anxious heart today. that take away my peace. turn my eyes back to You. giving me peace and hope and rest. ...The earth is full of the Lord's unfailing love. Thank You for walking with me through this long day. Be my help, my shield, my hope. You lead and guide me because of Your name. You have known the troubles of my life. You surround me with joyful songs of deliverance. ...the one who trusts in the Lord will have faithful love surrounding him. Use 2 large individual-serving sized, oven-proof baking dishes. Half-fill them with the colcannon, and top with a layer of sausage slices. Crack 2 eggs over the sausage slices, salt and pepper to taste, drizzle with a couple of tablespoons of cream, sprinkle on some parmesan, and bake at 425 for 25 minutes or until the eggs are set. I need to give credit where it is due: this is my husband's recipe. Perhaps if he had a blogger profile he would be MaestroChefDad. Irish Squeak made a perfect Saturday evening supper. Where's the Herb? The rules for Weekend Herb Blogging state "Entries can be recipes and/or informative posts featuring any herb, plant, vegetable, or flower." Colcannon features potatoes and cabbage in perfect harmony. 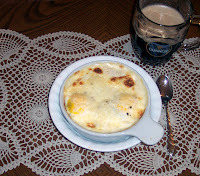 You'll find sample colcannon recipes here and here. Why "squeak"? Here's a recipe for traditional Bubble and Squeak. This week, Weekend Herb Blogging is hosted by The Well-Seasoned Cook. We went to a highland festival today. I didn't buy any music, but I noticed a CD for a band called Red Hot Chili Pipers. I just looked them up on Itunes, and I am cracking up. "We Will Rock You"...played by bagpipers and a few other musicians. Also "Hey Jude" and "Smoke on the Water". He's back in the hospital. Pneumonia. Two more broken ribs and a broken shoulder bone. He'll be there at least 3 days, and then he'll go to a Care Center for 3 weeks. I talked to him tonight -- he asked a nurse to call me. He hardly spoke; he listened to me, and replied to my questions very slowly. It's hard to believe that a year ago he drove himself the thousand miles to our house. Oh dear...my dad is requiring more care in his new assisted living center than he did at the previous. And they didn't tell me that some charges like laundry were not included in the base price. I was finally feeling calm about this. I wasn't stressing about his financial stuff. And now this. Still a thousand miles from him and absolutely uninformed about care for the elderly. My husband is bringing Mexican food for me and I'm going to sit on the couch tonight and watch the Avengers. Simmer port with herbs until reduced to a syrup; remove herbs. While syrup is infusing, season filets with salt and pepper and sear on a screaming hot grill 4 minutes on a side. If more doneness is required (for some yet-to-be-understood reason) place in a 375 degree oven for 5-10 minutes. 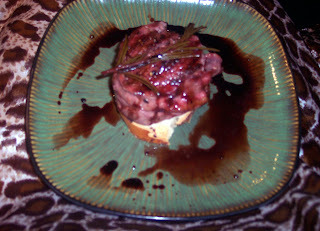 Plate on a slice of rustic bread and drizzle with the infused port syrup and balsamic reduction. Garnish with additional rosemary, if desired. This week, Weekend Herb Blogging is hosted by Jugalbandi . Rules for Weekend Herb Blogging are here. Two days ago Joy dumped salt all over the table and one of the dining chairs. The same day, Rose poured raw sugar all over her plate. Yesterday, Rose took my lipstick out of my purse and removed the lipstick from the tube, squished it into a little ball, and hid it under the couch. Today Joy found a spray bottle, and all my tax paperwork narrowly escaped a bath. Soon after that, she found Faith's lotion and annointed a doll and a plastic truck. And Faith was walking around with a blue marker upstairs but I confiscated it before any artwork happened on the walls. And Faith made me laugh by hiding under Joy's crib and saying "You're the government. We're hiding from you." I also heard her telling Rose, "No, you can't have that. You're whining. Whining will get you nothing." Well said. I read the book The Prayer of Jabez in 2000 and I prayed and meditated on the prayer, looking forward to the Lord leading me to new territories. Only a few days into my new prayer focus, I was talked into teaching a children's Sunday School class for a month each quarter. Now, I love leading women's Bible studies, and I love my own children, but teaching other people's kids is not something I find enjoyable. In fact it puts me in a panic. So that was not a very pleasant new territory. I began meditating on the Prayer again a few months ago, and suddenly found my father's financial details dumped into my lap. I can manage our family finances...usually...but my father's are rather complicated and I found myself telling my friend that I was through with the Prayer of Jabez if it's only going to lead to uncomfortable new territories! My friend encouraged me not to give up. And I thought about new territories and pioneers and God's unfathomable wisdom, and I realized that the expanding of one's boundaries is always going to be a stretching experience. Lord, keep me in the center of Your will, where I can expect Your guidance and blessing. Lord, I'm not sure I'm ready for "extending"; please enable me to care for my current territory. Keep me aware of Your presence. My back is giving me a lot of pain this week, so I've spent a lot of time in bed listening to my children play in the next room. I heard six year old Faith telling Rose, "You're the most beautiful girl in the world. But don't get proud about it. Don't be all 'I'm the prettiest girl in the world!' But...you are." In addition to being beautiful, Rose is affectionate and sympathetic. She was concerned about me at breakfast today. My back would not allow me to sit in a dining room chair, so I was on the floor next to a chair while my family had breakfast. Rose told me I should drink some tea. "Remember when I got my head stuck in the closet? Then I had some tea and I felt better. So you should drink some tea, Mama. It will help your back." Three year old Rose was fussing repeatedly this afternoon but she wouldn't tell me what was wrong. Finally she said that her dress hurt. I was a little puzzled but she came close to me and lifted up her dress...to show me that she was wearing a swimsuit underneath. A swimsuit in 12 month size. Well, yes, that would be uncomfortable! It's too small for her little sister, why did she squeeze into it herself? Laura is a homeschool mom who makes lovely soaps and lotions and other bath products. This week I received some Body Butter in Cool Mint and also in Sleepy Time (lavender and vanilla). The kids love these and so do I -- thick lotions that are great for eczema. The fragrances are long lasting (and helpful for migraine days). I also bought some Lavender Foaming Sugar Scrub; it lathers and exfoliates with a very natural lavender fragrance. My Dad was supposed to move from one assisted living center to another this weekend. Ten days ago, the administrator of the new place said the room would be ready today and he could move in. Friends packed his stuff in a uhaul and drove the four hours to the new place...only to be told that the administrator isn't there today, the room isn't clean, and they won't admit him without an assessment. Meanwhile he's all checked out of the previous place and was halfway between the two when we heard the news! Thankfully, there are friends in the new area that my dad can stay with for a couple days. I was sick with stress when I first heard about this hiccup, but I realized the stress wasn't my burden to carry. I remembered a line from Amy Carmichael's writings: "If precious to you, how much more precious to Him?" In The Heart of the Family, Adrian Plass mentioned P.G. Wodehouse and Jerome K. Jerome as two of his favorite authors. I think Wodehouse is delightful, but Jerome was a new name to me. I checked out his Three Men in a Boat (to say nothing of the dog) this week. The book was written in the 1880s and it has aged well. Humorous in a dry British style, it describes a boating vacation taken by three friends and their dog. Sprinkled through the story are descriptions of the historical sites they float past, and recollections of the friends' earlier boating journeys. My only complaint was that the book was not long enough. 1. my dad's move this weekend. Yes, I'm a thousand miles away, but there are little details I need to take care of, little details I want to take care of but can't yet for various reasons, and big details I can do nothing about....except worry and try to turn that worry into prayer. Dad is stressed about the move and there have been some stressful phone conversations. 2. a writing project. I'm writing another Bible study, and doing a lot of Bible reading in preparation for this project. I need to get back to my "Praying with the Psalms" posts, but I'm in the middle of reading the Epistles in 20 days. 3. reading books! Reviews coming soon.